(Nanowerk News) In a new article published in Nano Letters ("Hot-Carrier Seebeck Effect: Diffusion and Remote Detection of Hot Carriers in Graphene"), ICN2 researchers led by ICREA Prof Sergio O. Valenzuela have investigated hot carrier propagation across graphene using an electrical nonlocal injection/detection method. The results create new opportunities for nanoscale bolometry and calorimetry and could have a strong impact in the performance of conventional graphene devices. 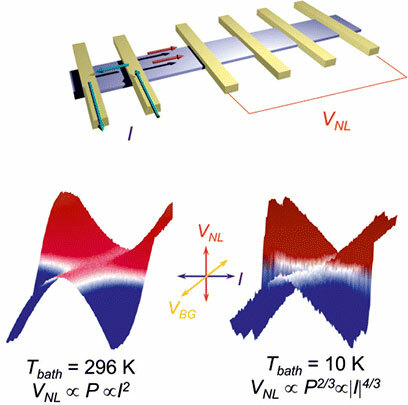 Due to the weak electron-phonon coupling in graphene, 2D Dirac massless carriers can present a much more elevated temperature than the graphene lattice. Such hot carriers propagate over long distances resulting in novel thermoelectric and optoelectronic phenomena. The research, led by ICREA Prof Sergio O. Valenzuela, Group Leader of the Physics and Engineering of Nanodevices Group and Dr. Juan F. Sierra, Juan de la Cierva postdoctoral researcher, is focused on hot-carrier propagation across monolayer graphene using a novel electrical method in a device with multiple metal leads. Hot carriers are generated locally by an electrical current, diffuse away from the injection point and are detected electrically in a remote voltage probe by measuring the thermoelectric voltage. The relationship between the voltage and the dissipated Joule power in the injector is then studied. At high temperatures, the voltage is proportional to the power, as in ordinary thermoelectric experiments using an external heater. However, this simple relationship is lost as the temperature decreases, which is demonstrated to represent a fingerprint of hot-carrier dominated thermoelectricity. The measurement scheme allows researchers to evaluate the characteristic cooling length for hot-carriers, which is a key parameter for the development of high-speed graphene based devices. This fact, apart from having a strong impact the performance of conventional graphene devices, creates new opportunities for nanoscale bolometry and calorimetry.